Does your team use Asana to organize tasks and people, but you're missing an email element of entering in your tasks? By combining I Done This with Asana, you get the best of both worlds. When you update a task on Asana, you can easily create an entry on I Done This. Any entries created on I Done This' end can also create a task on Asana. Both can be completed easily with the I Done This + Asana Zapier integration. If you haven't set up your Zapier account yet, please start here. Created your Zapier account? Great! You can find a list of triggers here. To set up Asana task actions to go into I Done This as entries, simply click on the "Make a Zap!" button. 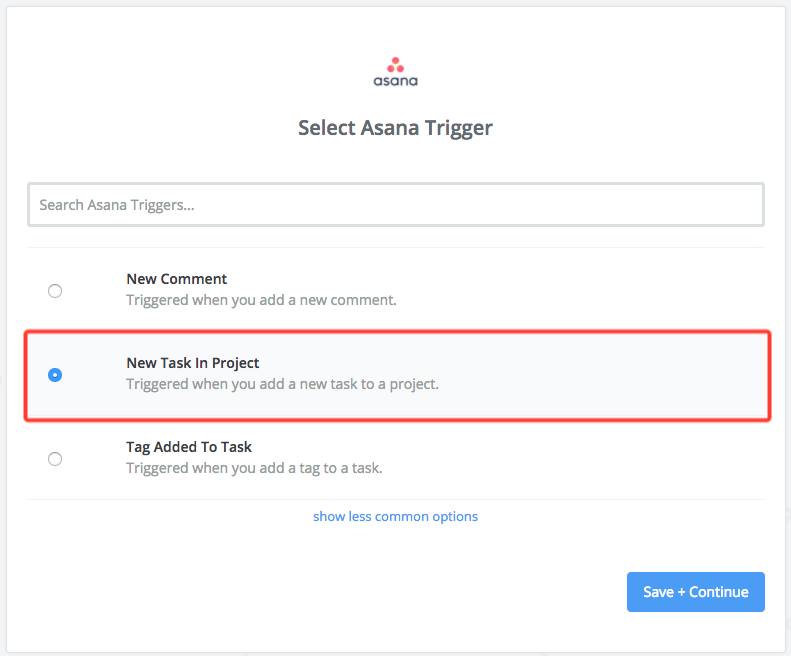 Once you have selected the app, you will have to select a Trigger from Asana. Triggers are actions that will cause a reaction to another application you plan on integrating. It could be triggers when Asana tasks are created or when they have been updated. The most popular choice we have is when Asana tasks have been created, it will be created as a Goal entry to I Done This. In the next steps, you will need to log in with your Asana account to connect to Zapier. You will also need to test your trigger. Just Update or Create a task so that Zapier can detect that you properly connected your account. Once you have selected I Done This, choose an action! This step is easy as you can only create an entry. After you choose an action, you will need to choose an account. Simply log in with your I Done This account. Once you have properly connected your I Done This account, you will need to enter in what will post when calendar events are being actioned. 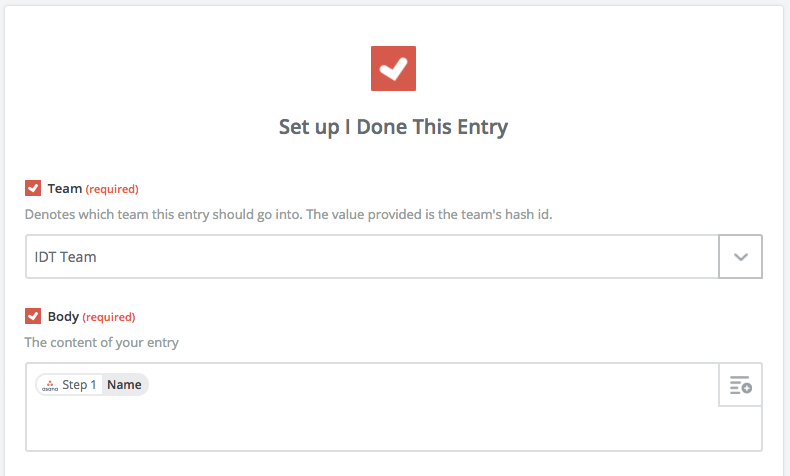 First, choose the team you wish to have your entries automatically created when Asana actions are triggered. After, you will need to have the body or the content of your entry filled. This will be your entry every time events within Asana actions have been triggered. It can be simple text such as, "I have updated a task". To be a bit more advanced, you can select certain elements of the Asana card like name or description of the card to be the post of I Done This. Simply click on the plus icon to display those elements. The last steps are to choose whether you want to have an "Occurred On" to post the time of the entry, and also the status! Which can be changed to make a Done, Goal or Blocker.